I’ve been seeing lots of awesome pictures the last few days and not in the usual places! I visited The Vordun Museum and Gallery, owned and operated by my very dear friend Jake Vordun, this last weekend for the opening of his latest exhibit ‘Sincerely Yours’. I’ve known for a long time that Jake was a keen collector of postcards and he has turned that passion into a totally unique exhibit for the The Vordun. Sincerely Yours is a collection of postcards sent from around the round showing both sides, the photograph and the text written on the postcard to Jake. The majority have been sent using Postcrossing which is a website that joins people randomly from around the world to send postcards too and once you have sent a postcard to the person you are assigned to send one then qualify to have one sent to you! Who doesn’t love getting a postcard in the mail? The Vordun has several other exhibits running including a selection of Arcade Winning Photographs and an exhibit by Mikel Monk and is well worth checking out. 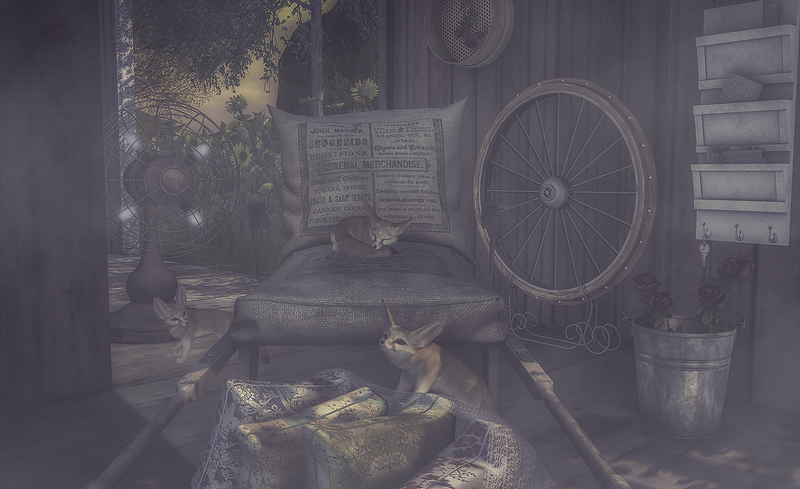 Now it’s a busy week we’re all heading into with the opening of FaMESHed, Arcade and a new round to sign up for Luxe Box for the ladies and coming in a week or so the opening of Skin Fair so my photograph today is a new area I made to relax in the barn at TaKe Heart! I’m going to need it!